If you’re planning on having a booth for your company at an upcoming trade show or convention, then there are certain items you absolutely have to have for your display. Obviously, there are the standard table throws, banners, and digital displays used for setting up your booth. However, if you’ve ever attended a trade show or convention as an attendee, then you know it’s all about the swag. Lots and lots of business swag. Of course, because most trade show exhibitors will provide promotional items of some kind, you may be wondering which types of merchandise are most effective. If you’re looking to provide business swag that makes an impression on potential customers, then we’ve got you covered. As the trade show marketing experts, we’ve helped a lot of exhibitors create the perfect trade show experience. In our experience, these are the types of promotional items that will get you noticed the fastest by your potential customers. Branded clothing items: Why do so many companies provide branded clothing? Because it’s one of the surest ways to get consumers to remember your brand. 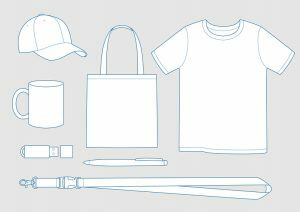 After all, you can never have too many t-shirts, and this is one of the most practical types of promotional items you can offer. The best corporate merchandise has high utility, and few items are more useful than high-quality T-shirts. Beyond that, as many as 85% of consumers remember advertisers who gave them a shirt or a hat. That kind of advertising impact can do wonders for promoting a business. Not only do your customers see your business’s name and logo when you first give it to them, but they also see it again each time they wear it. Office supplies: When was the last time you were able to find a pen when you actually needed one? Office supplies as promotional items are great because there’s a strong likelihood that they will be used. The more it’s used, the more your potential customer sees your brand name. And the more often they see the name, the more likely they are to remember it. As with clothing, this classic type of corporate merchandise works because it has a high utility value. Technology: We’ve already established that trade show attendees love business swag. However, if you’re really trying to set your booth apart from your competitors, then you have to up the ante. That’s why more and more companies are offering electronics and other hardware as promotional items. Technology giveaways don’t have to be anything too big or expensive; even simple USB drives or headphones will do. Think about what technology items you use the most often, and then consider if you could add your company’s brand name to them. Alternatively, you can offer some type of raffle or contest for a valuable gadget such as a tablet or smartwatch. If you’re looking for a way to really secure your potential customers’ interests, promotional items might be the best method for you. The key is offering items that are actually useful to potential customers, something that will be seen with regularity. If you need help designing and creating promotional items to give away at your next trade show or convention, contact Exposyour for more information.